The Hoover Steamjet Steam Mop also referred to as the Hoover SSN1700 Steamjet Steam Mop Dual Head is one of the best selling steam mops UK. It is powered by an impressive 1700 watt motor that produces high steam jet than most average steam mops. 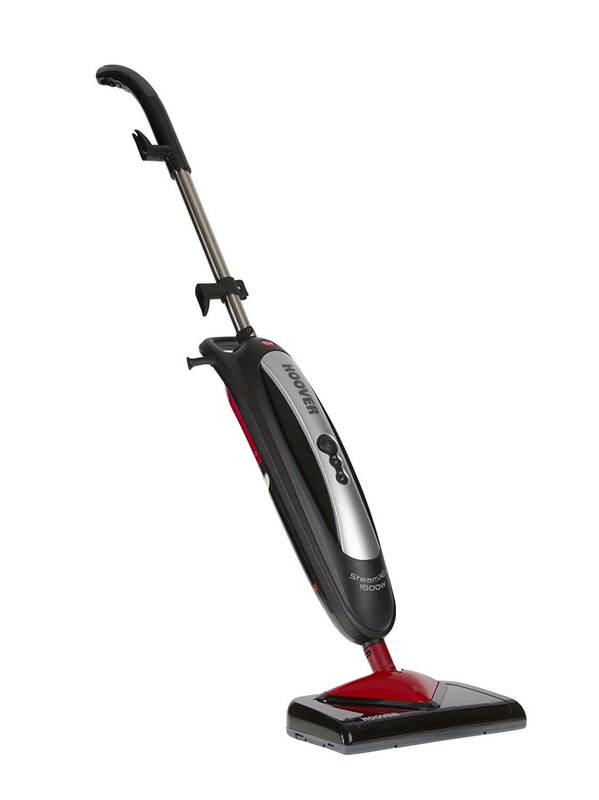 Unlike other steam mops; The Hoover steamjet features the cutting edge double head technology. “Two heads are better than one” they say. You can change the head shape into either rectangular or triangular shaped head on the fly. The wide rectangular head is wrapped with top quality microfibre pads that smoothly glide over large surfaces. It can tilt into both flat and vertical positions to enable you reach underneath tight spaces like below furniture. You can steam on demand by prompting the steam trigger. Has an ergonomically designed carry bag for easy storage and transportation. A LED indicator located on the steam mop will signal that the steam jet is ready to power any stubborn grease and grime on your floors when it turns green. This Hoover steam mop has a massive 0.7 litre tank, enough to give you 20 minutes uninterrupted steam time to lift away all dirt on your surfaces. It is slightly on the heavy side (3.2 Kgs); not so bad but could be lighter. The steam jet scores highly on many fronts: it is sturdy, durable, has a dual head and grinds away most stubborn stains. This steam mop is a quality product that will definitely give you value for money. The Hoover steam mop is powered by an impressive 1700 watt motor that produces high steam jet than most average steam mops. It is one of the best products in the steam mop industry at the moment. It has a high bar pressure and a glider to speed up your cleaning. The proper steam jet and scrubbing brushes that are integrated in the base of the steam mop make even the most stubborn grime to give way. The scrubbing brushes can be released by stepping on a foot pedal on the steam mop. The steam mop comes with two machine washable microfibre pads. The high temperature steam practically kills all (99.9%) germs and bacteria in its wake, leaving your surfaces properly sanitised. The ssn1700 has a massive 0.7 litre tank, enough to give you 20 minutes uninterrupted steam time to lift away all dirt on your surfaces. Activate a trigger on the handle that will release steam on demand. Employs the intelligent twist and steer technology to twist and turn into tricky angles without much of your effort. Big tank size to give you long uninterrupted steam time. Dries quickly, no messy wet surfaces; the carpets dry in 15 minutes after a steam glide. Specially made handle for easy handling. It has a fast heat up time. The Hoover steam jet steam mop only weighs 3.2 Kgs, a bit heavy . You will be impressed with the inbuilt steer and twist technology that makes the mop to turn intelligently round tricky places; you don’t have to keep twisting your arm as you navigate around your tables and seats. The triangular shaped head is stuffed with scrubbing brushes that scrub away any stain or grime. This gives you a superb way to clean both hard to reach corners, using triangular shaped head, whilst also covering large areas with the rectangular shape to save you time. You can scrub difficult to remove dirt with both the scrub and steam power. This way, you’ll get spectacular dirt-free surfaces with every clean. The Hoover ssn1700 steamjet dual head is suitable on many hard surfaces, from tiles, linoleum, stone, ceramic, marble to sealed hardwood floors and parquet. It can also be used on carpets. However it is not suitable for floors treated with varnish. The Hoover ssn1700 steamjet natural steam mop is well endowed with a long 7 meter electric code that gives you the freedom to move from room to room without having to unplug your sockets. You can use the steamer in both flat and vertical positions to reach beneath low furniture in your house. Never again will dirt linger under your sofas or bed because you can’t access such tight spaces. When you get one of this Hoover ssn1700 steamjet you can have peace with the knowledge that your steam mop will last you for a while. The steam cleaner has an inbuilt water purification component that stops lime scale from building. This steam mop is easy to manage and prolong its life. Setting up the steam mop is a breeze, there are only three parts to fix together and you are done and dusted. The Hoover SSN1700 Steamjet Steam Mop Dual Head comes with two replaceable machine washable pads. When these run out, you can get replacement pads at an affordable price at Amazon. The pack has both a high and medium density microfibre pads. The high density pads are most suitable for wooden floors while the medium density ones work well on tiled floors. As always, it is advised to vacuum your surfaces before steam cleaning for the best results. All in all if you have realistic expectations, this team mop will not disappoint. Unlike other steam mops, the pads of the Hoover steamjet dual steam jet[are held together by Velcro clutches to the steam mop. This ensures that the base pads do not come off easily when steaming.